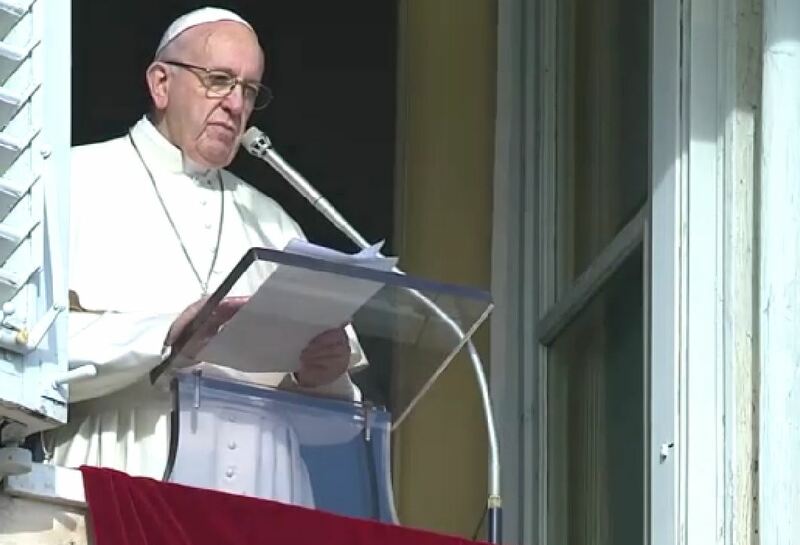 Here is a ZENIT translation of the address Pope Francis gave December 9, 2018, before and after praying the midday Angelus with those gathered in St. Peter’s Square. Last Sunday the liturgy invited us to live the Season of Advent and of waiting for the Lord with an attitude of vigilance and also of prayer: “watch” and “pray.” Today, second Sunday of Advent, it is pointed out to us how to give substance to such waiting: undertaking a journey of conversion, how to render this waiting concrete. The Gospel presents to us, as a guide on this journey, the figure of John the Baptist, who “goes into all the region about the Jordan, preaching a baptism of repentance for the forgiveness of sins” (Luke 3:3). To describe the Baptist’s mission, the evangelist Luke takes up Isaiah’s ancient prophecy, which says this: “The voice of one crying in the wilderness: prepare the way of the Lord, make his paths straight. Every valley shall be filled, and every mountain and hill shall be brought low” (vv. 4-5). To prepare the way of the Lord who is coming, it’s necessary to keep in mind the demands of repentance to which the Baptist invites us. What are these demands for repentance? First of all, we are called to reclaim the depressions caused by coldness and indifference, opening ourselves to others with the same sentiments of Jesus, namely, with that cordialness and fraternal attention that takes charge of one’s neighbor’s needs. To reclaim the depressions caused by coldness. One cannot have a relationship of love, of charity, of fraternity with one’s neighbor if there are “holes,” as one cannot go on a road with so many holes. This calls for a change of attitude. And to do all this also with special solicitude for the neediest. Then, we must lower the many rough spots caused by pride and arrogance. How many people, perhaps not realizing it, are arrogant, are rough, do not have that cordial relationship. This must be overcome by carrying out concrete gestures of reconciliation with our brothers, of a request for forgiveness for our faults. It’s not easy to be reconciled. One always thinks: “who takes the first step?” The Lord helps us in this if we have good will. Repentance, in fact, is complete if it leads us to acknowledge humbly our mistakes, our infidelities, and defaults. The believer is he who, through making himself close to a brother, as John the Baptist, opens paths in the desert, namely, points out prospects of hope even in those impervious existential contexts, marked by failure and defeat. We cannot give up in face of negative situations of closure and rejection; we must not let ourselves be subjected by the mentality of the world, because Jesus and His word of light, of love and of consolation is at the center of our life. It is He! The Baptist invited the people of his time to repentance forcefully, vigorously and severely. However, he was able to listen, he was able to carry out gestures of tenderness, gestures of forgiveness to the multitude of men and women who went to him to confess their sins and have themselves baptized with the baptism of penance. John the Baptist’s testimony helps us to go forward in our life’s witness. The purity of his proclamation, his courage in proclaiming the truth succeeded in reawakening the expectations and hopes of the Messiah, which were dormant for a long time. Today also, Jesus’ disciples are called to be His humble but courageous witnesses to rekindle hope, to make it understood that, despite everything, the Kingdom of God continues to be built day by day with the power of the Holy Spirit. Let each one of us think: how can I change something of my attitude, to prepare the way for the Lord? May the Virgin Mary help us to prepare day by day the Lord’s way, beginning with ourselves, and to scatter around us, with tenacious patience, seeds of peace, of justice and of fraternity. I greet you all affectionately, pilgrims from Rome, from Italy and from various parts of the world. In particular, I greet the numerous young people of the diocese of Orvieto-Todi. Thank you and I wish you a good Advent journey! I greet the faithful of Trapani, Caltagirone and Bronte, and the Confirmation candidates of Alme (Bergamo).